Over the years, I read several times that simmering a can of sweetened condensed milk on the stovetop for several hours would magically transform the contents into dulce de leche. This sort of made sense. After all, dulce de leche, translated, means sweet milk. Yet the claim seemed too good to be true. Recently, I posed the question on The Fountain Avenue Kitchen Facebook page and the comments amazed me. Scores of people—interestingly, many from South America and England–told of doing this regularly and raved about how delicious it is. Some also shared stories of the can exploding, resulting in a major mess on the ceiling. Others were concerned that the coating on the inside of the can would leech into the milk. Curious, but wanting to avoid a kitchen disaster, I transferred the condensed milk into Mason jars and used my slow cooker. The result was exactly what was claimed, without the mess. After 10 hours on low, the condensed milk turned the color of caramel and was the consistency of a thick pudding. 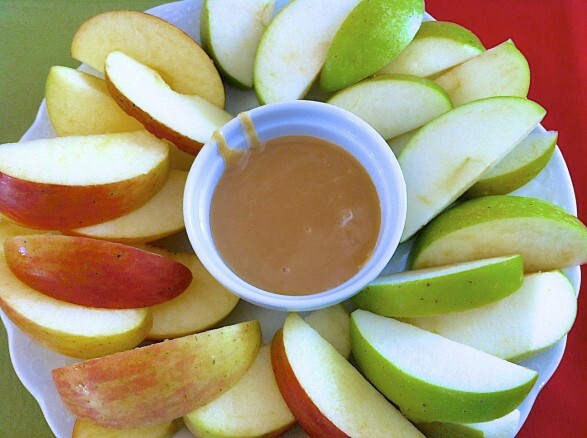 My kids love using it as a dip for apple slices or a spread on toast. 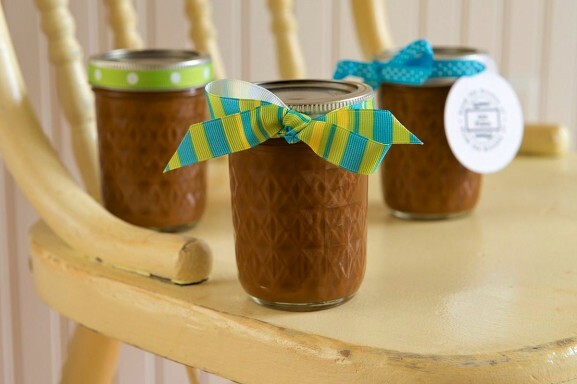 Mason jars are not only perfect for cooking and storing; they make a jar of this dulce de leche into a wonderful gift as well. Simply tie with a bow. When finished cooking, the dulce de leche will be set like custard. 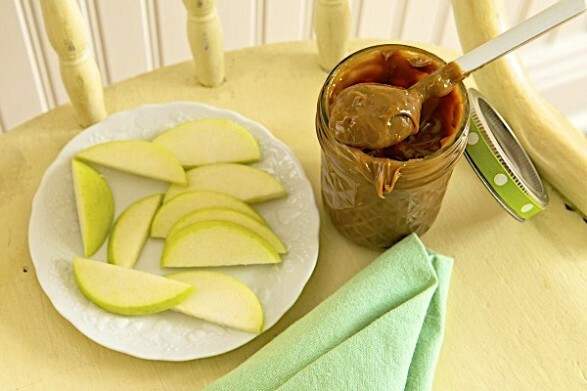 Stirring with a spoon will soften to a spreadable consistency similar to that of a thick caramel...perfect for dipping apples! For a consistency similar to caramel sauce, cook for the shorter timeframe mentioned. Open cans of sweetened condensed milk and pour into three half pint jars, dividing evenly. Put on lids and rings. Place jars in crock pot and add water to just reach the bands of the jars. Cook on low heat for 6-8 hours (for caramel sauce consistency) or 10 hours (for a consistency more like pudding; see notes). Carefully, remove jars from the crock pot and enjoy! Initially, I cooked this for 10 hours and savored the pudding-like dessert that was magically created. Then, the thought occurred to me that cooking for a slightly shorter amount of time might create a consistency that could be drizzled over ice cream or my favorite apple cake. I made another batch and checked at six and at eight hours. The dulce de leche was a syrupy consistency both times. (This led to my new favorite use for this sweet treat: a make-at-home dulce de leche latte! The recipes for this as well as the apple cake are available on my website.) Select a cooking time based on the consistency you desire, and don’t hesitate to open the lid and check it as slow cookers vary based on size, model, etc. Ann, you are my hero! I’ve been dying to try this but had so many fears of the unopened can on the stove. Can’t wait to try your way! And just beautiful gifts! I can already picture my gift cards! Pinned, tweeted and shared on FB! You rock! Thank you very much, Joan! I am smiling from ear to ear and look forward to seeing how you take this deliciousness to the next level of dessert perfection! question. do i tighten the lids tight? I tightened them firmly but not REALLY tight. I wanted them to be tight enough that the lid wouldn’t slip and cause leakage. Nothing came out and the cans sealed as they would with normal canning. I do store in the refrigerator though, just to be safe. I have heard of this as well, actually on Pinterest and it looks fabulous! Think I am going to try this, I really need to get some mason jars too. It was one of those things I finally had to try! I was skeptical, but it really works! What a great idea! Can’t wait to try it! I hope you love it as much as we do, Mignonne! Found the 8 oz mason jars yesterday.. Going to put this in crockpot overnight. Thinking some might be good on the baked apple oatmeal tomorrow. That sounds like a great combination, Mary Lou! If you want the consistency to be thinner–to drizzle like caramel sauce, for example–take the jars out on the shorter end of the time frame. You could also take one out after 7-8 hours, leave the others in for 10 and see which way your prefer it. Either way, it tastes great! Had in for 8 hours, so crockpot stopped at about 4:40, went to warm mode. It is pretty thick, but still good! Next time I will try on a weekend when I am home and will cook for just 6 hours. It was heavenly on the baked apple oatmeal! I put some on top and then heated in microwave at work. That sounds wonderful, Mary Lou! It is definitely something to experiment with as the consistency can be almost any way you like it. Thanks for the comment! and they don’t need stirring – and the bottom of the jars don’t have burned product in them? Sounds like a challenge I must take! I know…it seems too good to be true! The only thing I can suggest is to decide if you want the dulce de leche firmer or more syrupy. It won’t hurt to open the lid and stick a spoon in to check. The first time, I just let them cook for 10 hours–no checking or stirring. The second time, I opened at various stages. Thick or thin, they taste great and no burned bottoms! Let me know if you try! You are welcome, Lisa, and I hope you find it as easy and delicious as I do! Thank you so much for sharing -this sounds fantastic! Did you put a cloth in the bottom to cushion the glass jars? Or, doesn’t it need anything? Can’t wait to try it. I did not, Keita. I actually didn’t think of it, but the heat is low enough that there is no burning or boiling to make them jiggle in the slow cooker. Hope you love it! I hope you find them soon, Keita! Let me know how it turns out! I am definitely doing this! Thank you! I hope you love it, Kath! Oh my goodness! Thank you for sharing this recipe/method. I’ve always been afraid of the “exploding can,” too, but now I can enjoy Dulce Le Leche at will. Mercy. I know…I would have been one of those people who would have been cleaning the ceiling after the can exploded!! I was thrilled that this method worked so well and with such ease. Enjoy! Don’t you just love it when simple is so delicious?? Enjoy, Amy! Does this need to be kept refridgerated? The jars do seal but I have refrigerated just to be safe. I am making Banoffee Pie which requires dulce de leche and since this is my first attempt I think I messed up. I “boiled” this in the oven as required for 1.25 hours and it never got thick. I wasn’t sure what I was doing I guess so I took it out and actually poured it into the crust of the pie. I was thinking that perhaps it would firm up once refrigerated? Now I am not sure what will happen? I am going to refrigerate it overnight. Next time I should bake it longer? Idk. I have never baked the dulce de leche and would recommend the slow cooker method as I describe here. If you have any questions, let me know. I hope your Banoffee Pie turned out! I;ll try this out soon Ann!! Thanks, Katrin! The neat thing about this option is that you can see when it hits different stages and stop cooking when it reaches a consistency you like. Hope you like! This is even better when made with homemade sweetened condensed milk. As good as it is, much healthier and tastes fantastic. Great suggestion, Gayle! That is something I might have to try very soon! Thank you very much for letting me know! I will pop over and take a look! Ann, I now have 9 jars of this! I am giving a jar and apples in pretty cellophane bag to friends and family this year, along with some homemade cookies. What a wonderful gift, Mary Lou, and I love your idea of giving them with apples! I am so glad you liked this as a gift idea and appreciate the feedback! Are you only supposed to fil the half pint jars halfway? My 14 oz can only fills 1 1/2 jars filling them to the bottom rim, not all the way to the top. Help? For this recipe, I use 2 14-ounce cans of sweetened condensed milk and that amount will just fill 3 8-ounce (half pint) jars. If you only have one can of milk, I would divide it evenly between 2 jars. It won’t fill them the whole way but the dulce de leche will still turn out fine. I hope this helps! Have you tried this with the homemade version of sweet milk. I have not but I really need to try, Karin. If you do, please report back! Oh yum I love dulce de leche, yours looks so good! Thank you, Rosie…and me, too! It is pretty tasty! Great find on the dollar store canning jars, Nina! I have not used fat free sweetened condensed milk and am wondering whether it will set up the same way. I would love to know your results. If it doesn’t work perfectly, I assure you the regular milk does! I saw that you made the slow cooker caramel sauce using fat free sweetened condensed milk. Just wondering did it turn out for you as the full fat one shows? Please let me know. Ann, This also makes perfect ‘Turtles’ simply coat bottom of mold with delicious chocolate add a spoonfull of the dulce la leche seal top with more delicious chocolate, chill and ENJOY!!! Have been making these for over 40 years and still get requests every year. I love this idea, Norah! Thank you very much for taking a moment to share! I have made this using the both the stove-top and the slow-cooker. I make my own sweetened condenced milk (an un-cooked version) and it makes great dulche de leche. I had a jar get pushed to the back of the pantry and it was still good a year after it was made. I leave about 1 inch of space at the top of each jar. I hope this helps. That is great information, Debara. I am so glad you like the recipe and thrilled to hear the shelf life is long! I did this recently for a cheesecake I made for my husband’s birthday and it came out perfect! I am making more of this today Ann and plan to make the salted hot fudge sauce as well. They are great gifts! I cannot wait to try this! Thanks for the great idea! Hope you love it, Jean! It seems no one else has run into this, but I cooked mine on low for 9 hours because I wanted a thicker consistency. The top half of the jar tasted delicious, but the bottom half was very gritty from sugar and was inedible. Any suggestions? I wonder if your slow cooker cooks a little hotter than some? If you cooked on low, as directed, you could further mitigate the heat by placing the jars on a rack placed on the bottom of the cooker. This will keep them off the direct heat and may help. I have never needed to stir, but you could do this once or twice during the cooking process as an added precaution. Other than that, the only thing I can think of is to double-check the expiration date on the cans. I hope this helps! When I was growing up, my mom would make this regularly in a pot of water on the stove, with never a disaster. Afterwards, we would sit around the can with spoons and go to town on it. It was sooooooo delicious. My sister and I were just talking about it the other day, and then I find your post. My mom passed away unexpectedly 3 years ago, so I wasn’t able to get the particulars from her. So glad I found your post. Thank you. I am so glad you found this recipe, too, Elaine and love the special memories. Thank you for taking the time to share them, and I hope the taste when you make it again is every bit as sweet as your memories! When range is fitted in this manner, it is less likely to get spoiled by food particle during cooking. been looking for an apartment to buy. Pingback: Crock Pot Dulce de Leche Caramel - Chocolate Chocolate and More! Made this, but my slow cooker doesn’t say low heat so I wasn’t sure what temp to put it at. I had it way too low for hours before I realized then turned it up to around 325 degrees. Then kept on cooking it. It ended up still turning out great. Very creamy and so yummy. But love it cause it is just fool proof. Can’t mess it up it seems. Trying my second experiment batch now. Can’t wait to see how this one turns out. Thanks for the great feedback, Nancy. So glad it turned out so well! Made this for the first time last week turned out great, so easy, going to use them for gifts. Got 12 8 ounce canning jars at target for under nine dollars also at target sweetened condensed milk for a 1.50 a can. I love it when a great gift is economical, too. I’m happy this was a success and appreciate your comments, Ginnie! Ann, why mason jars? I’m not a canner, so I don’t know if these lids have special properties. I save glass jars/lids for other reasons, can I just use a sanitized small mustard jar or other type of jar, or is there something about the mason jar lid that is necessary for this process, like, might it burst, etc.? Great question, Erika. I recommend Mason jars because they will withstand the heat and the proportions work well in this recipe, but any food-grade jar (like a mustard jar) should work well. The Mason jars do seal, but I suggest storing in the refrigerator where the dulce de leche will keep for many weeks. Hope you enjoy! Thank you, Ann. This came out perfectly. I agree with the drizzle consistency. I gift along with your latte recipe. Thank God for Ann Fulton & her grandmother!! Thanks for the thoughtful comment. How lucky your friends will be to receive this! WOW! How exciting to see Dulce de leche in a mason jar! Thanks Ann. I will be trying it with some Nutella for a twist, and another one with sea salt. Thanks, Marisol, and I love your idea of the dulce de leche-Nutella mix. Let us know how it works out and, if you like, what proportions you use! Pingback: Dulce de Leche Parfaits - Chocolate Chocolate and More! Our favorite dessert is from Chevy’s Mexican Restaurant, the Cajeta Ice Cream Sundae. This caramel w/b perfect for that: toasted coconut, rich vanilla ice cream & lotsa your homemade dulce de Leches. Can’t wait to make it at home! I am hungry just reading your description, Cyndi! Can you make more than 3 jars at a time ? Good question and absolutely, Kathy. Just leave room around the jars for the water to circulate.